Earth has some battle scars from back in the day. 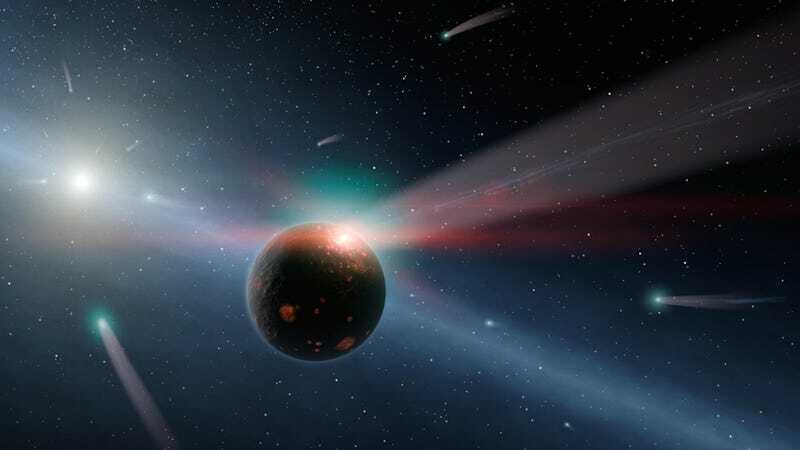 When the solar system was still young and wild, roughly 4 billion years ago, Earth, its Moon, and Mars were attacked by a series of asteroid assailants. It’s long been assumed that the space rocks involved in the assault—called the Late Heavy Bombardment—are now floating around in the asteroid belt between Mars and Jupiter. But new research suggests there might have been another group of bullies, too. After months of running simulations on planet migration in our solar system, David Nesvorny of the Southwest Research Institute (SwRI) in Boulder, Colorado, has concluded that planetesimals—clusters of rock and dust that are basically failed planets—might have impacted Earth, the Moon, and Mars during the Late Heavy Bombardment. Nesvorny’s research partner, SwRI scientist William Bottke, presented the duo’s findings at the 229th gathering of the American Astronomical Society (AAS) earlier this month. Bottke’s simulations show that when the big planets made their big move, they left some planetesimal trash behind. Those planetesimals are theoretically much more massive than the asteroids currently between Mars and Jupiter, and could be a better explanation for the huuuuuge craters found on the early Earth, and well as present-day Mars and the Moon. Why didn’t we think of this possibility sooner? Bottke thinks that widely accepted scaling laws used to measure craters don’t accurately reflect how massive the objects that formed them really are. Developing more accurate scaling numbers will help researchers like Bottke and Nesvorny gain a better understanding of the relationship between life on Earth, which began around the end of the Late Heavy Bombardment, and impact craters. It’ll help determine whether or not we should look for clues in the asteroid belt, or as Bottke suggests, search elsewhere.